Posted on July 27, 2016 at 12:53 pm. Car washes, book sales, picnics and all things summer at BCC! With the temperature rising and school out, BCC’s residents have been busy with summer programming. Many of BCC’s residential population attends summer school, and for those who do not, the various summer programs that keep the youth active, engaged, and productive. The community service program on the Baltimore Campus is run by BCC’s Spiritual Life Department, consists of five girls and seven boys, and meets to work on projects that benefit the community. 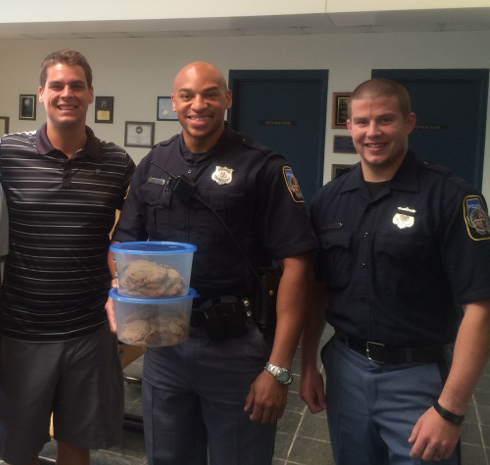 One of the most recent projects was to bake and deliver homemade cookies to the local police precinct. This project was important to BCC’s staff because of recent events throughout the country. Some youth at BCC have not had positive interactions with law enforcement and the simple act of baking and delivering cookies provided an opportunity to start a dialogue and build new relationships. 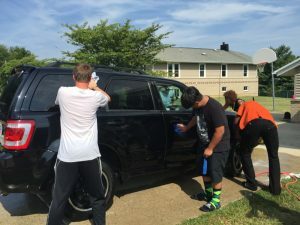 Work program coordinator, Clifford Guest, invited BCC employees to get their cars washed by the residents. It taught the youth teamwork and other soft skills needed for success in the workplace. Proceeds from the car wash will help offset the cost of the trip to Six Flags scheduled for later this summer. Youth in the work program also partner with the maintenance team. Most begin in housekeeping and some move up to shadowing maintenance technicians. Other work program activities included creating a volleyball court on BCC’s Baltimore campus, relocating furniture and books from the now-closed North Carroll High school to Strawbridge School, and preparing the new girls semi-independent house in Reisterstown, MD for its opening this month. The recreation program challenged the youth with nature hikes, the ropes course, swimming and competitive sports games.